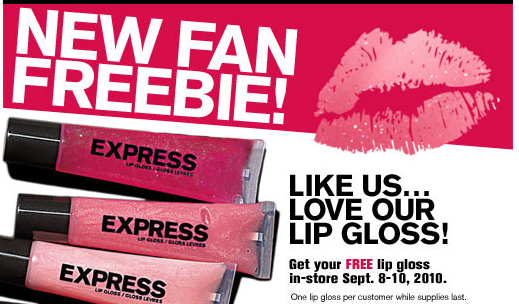 Free Lip Gloss at Express – In Store! You can score a free lip gloss at Express. Just head over to their Facebook fan page and “Like” them. Then click on the new fan page tab at the top (you may have to click on the arrow to find it). Complete the form to get an in-store coupon for a Free Lip Gloss between 9/8 – 9/10. Note: You must like them by 9/3 to get the coupon. More New Coupons: Old Orchard, Lactaid, Tetley, Glade & More! GONE: $5 For a $10 Wawa Gift Card – Good Toward Gas!